Meet the gorgeous Millie she has been in foster since October 2016, she is looking for her forever home . Millie is a character she is so full of fun despite being 9yr old she acts more like a younger girl. Please don't write her off because of her age she is extremely sprightly. She adores humans whether they be adult or very young children, she has a fan following on the street where we live, everybody stops to pet her and she in return gives that affection back, her youngest fan is 2yrs old, the eldest 87. She will bark if anybody knocks on the door but once they enter she mugs them for cuddles and kisses and is so happy to see visitors. Millie loves to play with toys and as long as you play so will she. Millie loves her balls most of all and is extremely good at football and catch itâ€™s not often she misses, she also loves her tug rope, however, she will destroy squeaky toys in seconds. She gives you each paw on command, sits and rolls over, she reacts to hand and voice commands, such as sit, roll, paw and other please, when you rub her belly, well thatâ€™s bliss for Millie she will grunt and groan to show her pleasure. Her favourite treat is pigâ€™s ears and she will do anything for one. She loves her walks, she gets so excited she will help you put the head collar on and start yapping if you're too slow to go out the door, Millie is good on the head collar she tends to walk in on your legs she has good recall and will come when called, she is currently in foster living happily with a number of other dogs, she does tend to chase cats outside her home. Prior to being in foster with the other dogs, she was living as a sole dog and was extremely reactive towards other dogs. 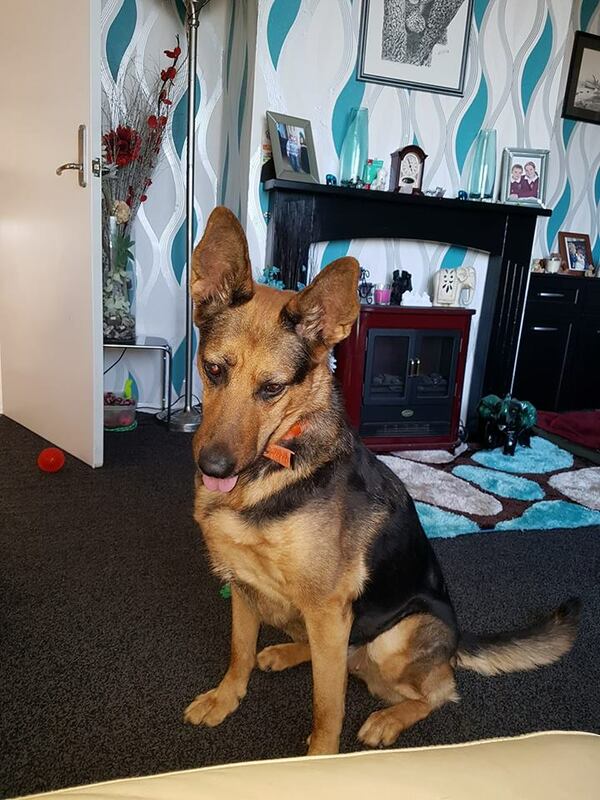 We feel that she would revert to this behaviour is she was to be rehomed as an only dog therefore we are looking for a home where there are other dogs living in the home. Millie has given me so many laughs at her antics from pinching toast out of the toaster which she is partial to, to using her eyes to communicate what she wants, she places her head where you can see and when you ask what Millie wants, her eyes move in the direction of what it is then back to you, often when you ask she will take you to the treat tub or cupboard. She will sit behind you and put her head on your shoulder this girl is so affectionate she will steal your heart she has mine.